When did India take the first steps towards relaxing the controls associated with the "license raj"? What was the average GDP growth rate for India for the period 1960-1980? India in 1985 had the highest level of tariffs in the world. What were the nominal tariff rates as percentage of values in 1985 for Consumer goods? In 1991, India was only weeks way from defaulting on its external balance of payment obligations. India's immediate response was to secure an emergency loan from the International Monetary Fund by pledging India’s gold reserves as collateral. How much gold did India pledge and what was the amount of money it borrowed? Answer. India's immediate response was to secure an emergency loan of USD 2.2 billion from the International Monetary Fund by pledging 67 tons of India's gold reserves as collateral. India’s customs tariff rates have been declining since 1991. What was the ‘peak’ rate in 1991-92 and 1997-98? Apart from Dr. Manmohan Singh, who was the other candidate being considered by Narasimha Rao for the position of Finance Minister, as per PC Alexander’s narrative? Which car companies dominated the Indian automobile sector in 1970’s? In order to promote competition in aviation sector, the government adopted a policy through which private players were allowed into aviation sector in 1991. What was the name of this policy? Which was the leading soft drink brand in India until 1977? Who was the Officer on Special Duty (OSD) to Prime Minister PV Narasimha Rao in 1991? Questions will be posted at 6 PM on Twitter and Facebook daily from 11th -22nd March 2016. Answers given within 12 hours of posting the question will be accepted, answers posted after would be considered void. Only one answer per person will be accepted, in case of multiple answers only the first comment will be considered. If the answer is in more than one part, then the whole answer should be correct. Even if one part of the answer is wrong or missing, then the answer will be considered wrong. Answers submitted from 6 PM to 6 AM (of the next day) will be considered for the prizes. Winners will be chosen by the method of random sampling. Disclaimer: The decision of the organization (CCS) will be final and abiding. Any objection to this may be notified to the committee by mailing us at indiabefore91@ccs.in. The quiz committee will take action (if any) accordingly. The Winner will be announced the next day of posting of the question. Winners will get attractive prizes. 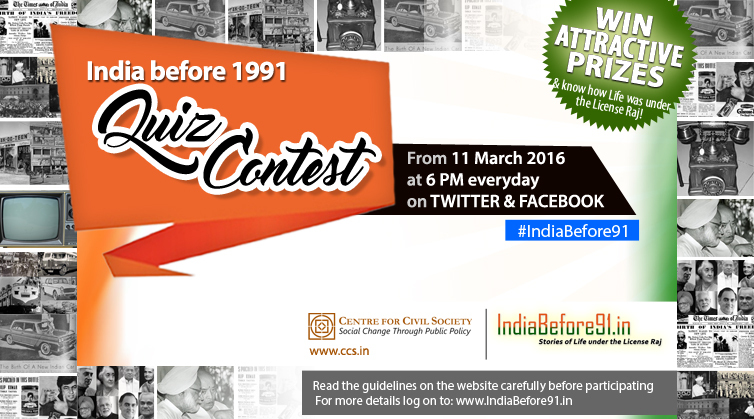 If you have any question regarding the Quiz rules or marking scheme, please write to us at indiabefore91@ccs.in. Suggestions are welcome. Please spread the news of this Quiz and invite your family and friends (by tagging them in the comments) to participate.